On July 2nd, 1937, Amelia Earhart's attempt to become the first woman to fly around the world came to an abrupt end over the Pacific Ocean. She lost radio contact with Itasca, the Coast Guard ship that was serving as her radio contact, and the plane supposedly went down near the tiny atoll of Howland Island. Now, 75 years and uncounted millions of dollars later, we haven't found a trace of Earhart, her plane, or Fred Noonan, her navigator. Today is Earhart's 115th birthday, and it's time for us as a society to stop dwelling on the past and move on. Since this is a year of big Earhart related anniversaries, there has been added focus on searching for the legendary pilot's plane and final resting place. The latest $2.2 million investigation into her disappearance has once again ended without any new leads or developments. We anticipated ten days of search operations. Due to equipment problems directly attributable to the severity of the underwater environment at Nikumaroro, we only had five days on site. In that time we saw no objects that we recognized as aircraft debris, but we have volumes of sonar data and many hours of high-definition video to review before we'll know the results of this expedition definitively. Granted, they did not have the time they expected on their expedition and conditions were less than ideal. That said, based on history, TIGHAR probably wouldn't have found anything anyway. Right after Earhart's plane went down, a massive 17-day, $4 million search spanning 250,000 square miles took place. In 2010 dollars, that is a $60 million investigation. What did they find? Like the mysteries of Unsolved Mysteries, they found even less than squat. There have also been recent searches that were just as inconclusive as the original search. In 2011, divers claimed that they found the plane. That was immediately debunked. In 2010, there were claims that a "finger bone fragment" was found. First off, it didn't belong to Earhart. Secondly, what the hell would we learn from a finger bone? That she was good at pointing? 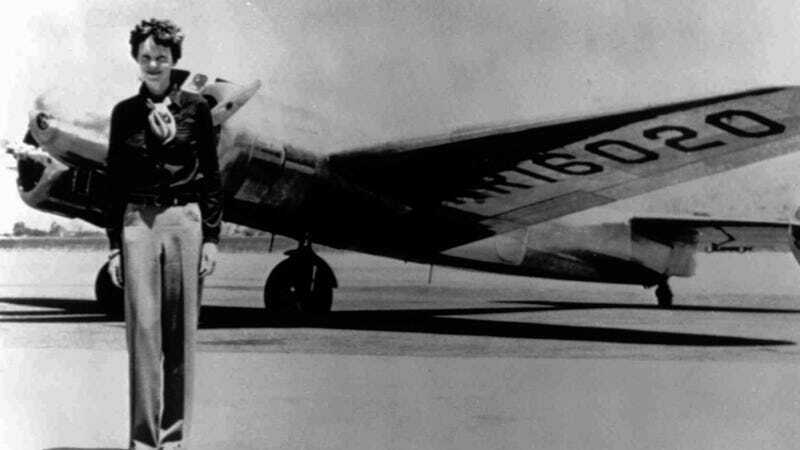 If we find Earhart's Lockheed Electra now, what will we learn? Not too much. The first airplane black box was installed in 1953, so there will be no data for us to guess what really happened to Earhart. And no, I'm not actually suggesting that the black box would be useful or intact after 75 years under the ocean if it existed in the first place. It's the mootest of moot points. Earhart's story is fairly romanticized because of the mystery surrounding the disappearance. If we find the plane, it will ruin the facet that has made her such an enigma for 75 years and will raise more questions. Was it pilot error, weather problems, navigational issues, or a mechanical failure? Those are questions that will still probably never be answered. Instead, the plane, or, more likely, pieces of the plane, would be in the National Air and Space Museum with a plaque that can't tell us more about what happened. Since Earhart is 115 years old today (that's older than me! ), even if she, or her navigator Fred Noonan, did somehow survive the crash and established a treetop residence on a remote island somewhere in the South Pacific, it's HIGHLY unlikely that they'll be wandering out to regale us with the story of what happened. The two people that know what happened are dead. If the plane or their bodies are found, we'd have more theories but even then there's no guarantee we'll get a definitive answer. That would be even more frustrating than the current situation. As humans, we naturally desire closure. We have curiosities that we need filled. But sometimes we just need to accept that we may never know what actually happened. This is one of those times. It's time to make investments that encourage the continuation of Earhart's pioneering spirit and advance the future of airborne recordmakers and stop investing literally millions of dollars in a past we benefit little from understanding. We should encourage other aviation adventures that Earhart might have undertaken today. We could be encouraging adventurers to set new altitude, speed, and duration records instead of finding possible hairs of Earhart's that were really pieces of a coconut shell. If historians want to keep hunting good for them, but the media attention spent on every new (usually misleading) development would be better spent getting excited about new accomplishments not old accidents. Otherwise, the reality of Earhart's bravery risks being confused with the mystery of her disappearance.